Poor Polka King. Suffering from the flu, it didn't look good for him to play any late night hockey. But a nice power nap seemed to reinvigorate him enough to participate. The first thing I said to him while picking him up was that he needed a nice bowl of congee. Yes, the Chinese rice gruel which is usually a vessel for such things like century duck eggs, pork blood, liver, kidney and stomach. For some, if they weren't sick before, just thinking about this might make them hurl. Fortunately, Polka King is Chinese, he's used to it... My recommendation was to go out for a nice steaming hot bowl of congee for his sore throat after hockey. I always devise a plan to make people eat out with me. This was no different. So after a spirited game, we quickly got ready to go and headed off to Nancy Wonton House. I've always wondered about this place. It's been at its location on Victoria for quite some time; but I've never had a chance to try it. From the outside, it looks like any other Chinese wonton joint with its bright lighting to the gaudy yellow signage. I think we arrived as they were preparing to close, so we hurried up and ordered and even paid before starting to eat. Since Polka King was ordering the congee already, I decided to try their Wonton Noodles and a plate of Yeung Chow Fried Rice (Pork & Shrimp Fried Rice). I gotta say that it was a pleasant surprise when the wonton noodles arrived. By just looking at it, I knew this was going to be one fantastic bowl of noodles. First of all, the predominantly shrimp wontons were freakin' huge. Second, the noodles were thin and slightly translucent (a sign of perfectly cooked wonton noodles). Third, the broth was a nice rich colour and steaming hot. I dug in and boy, those noodles had a chewiness and bounce that we all look for in a good bowl of wonton noodles. T he soup was indeed flavourful without being salty. 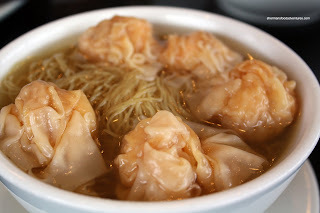 The wontons were jam-packed with crunchy shrimp and only a modest amount of pork. Absolutely delicious! Polka King's Minced Beef Congee was also pretty solid. Thick, burning hot and full of hand-minced tender beef, the congee had a nice consistency. Neither being too salty or under-seasoned, it did not reek of MSG. At the end, it did begin to get a bit watery. Congee Noodle King is better; but this was still quite good. 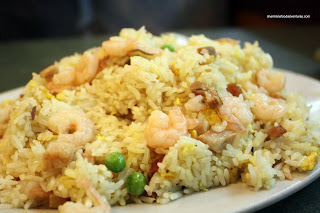 Our dish of Yeung Chow Fried Rice also appeared to be quite good despite the curious ly small shrimp. The rice was firm and there was plenty of shrimp and BBQ pork. There was just the right amount of salt and the dish wasn't oily. The only criticism would be that the fried rice was a little on the dry side. However, there was very little to complain about the food here at Nancy Wonton House. Also, with relatively cheap prices, I can see myself coming here for more eats, even if Polka King didn't have a sore throat. 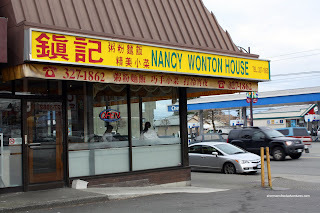 Alright, within a few weeks, we returned to Nancy Wonton House since my aunt and uncle were in town for a visit. They wanted to eat some good ol' wonton noodles and congee for lunch. Well, I could've taken them to Congee Noodle House, Congee Noodle King or even McNoodle; but with NWH fresh in my mind, here we are again. 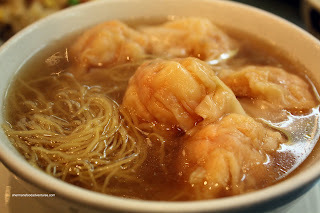 Now, in respect to the Wonton Noodles, it looked the same and really, the wontons and broth were no different than before. However, the noodles were not. Unlike the first time where it was chewy and a bit translucent. These ones resembled the texture of instant shrimp noodles instead. Was it cooked too long? Not enough lye? Whatever the case, they were not as good as before . So make your own conclusions with that. 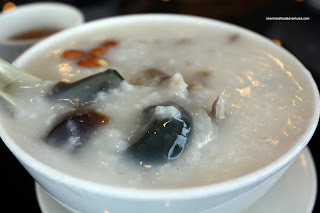 We ordered 3 bowls of congee: Preserved Egg and Salted Pork, Chicken and Offal. All three were solid with plenty of ingredients within a thick lightly seasoned congee. 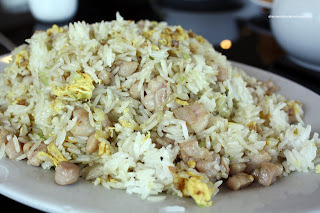 Other than a few clumps of rice, the Salted Fish and Chicken Fried Rice was pretty solid. The rice was dry (a tad oily) and well seasoned with the salty essence from the fish. It's an acquired taste (it can smell up a room!). So our second visit was pretty solid other than the noodles. I can only assume that it was an aberration since everything else here is pretty good.